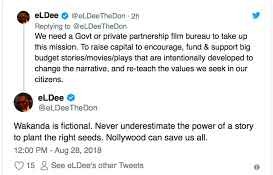 Veteran Nigerian rapper, Eldee The Don has recently shared in a series of tweets that he strongly believes Nollywood can save us all. He however added that script writers and story tellers must deliberately begin to aggressively promote fairness, hard work, integrity, honesty, respect’. ‘Nollywood is the one thing that connects all Nigerians besides music and football, and it has the potential to shift the mentality of the population. Our writers must become more careful with the content that we feed our people. Our stories must deliberately begin to promote fairness, hardwork, integrity, honesty, respect, accountability, kindness self respect, resilience.. I could go on”.